← Who wants to be a Modernaire? I’ve been dying to get in here and do some posting, but I’ve also been totally doing stuff. Like moving and working at a job where they pay me and everything. But I have been writing, I really have–I have the first four parts of a five-part series on Labyrinth mostly sketched out, for instance. That’s going to be epic–in the true sense of the word, involving quests and to-be-continueds and codpieces, not in the internet meme sense of the word. I was hoping to get around to starting my Labyrinth series this weekend, but fate intervened. I took the girls* to lunch today at a local spot called Gullifty’s–nondescript from the inside, but family-friend (read: high chairs and crayons) and with surprisingly delicious food, including a homemade applesauce that my newly minted one-year-old nearly gagged herself on, in the good kind of toddler way. One of the reasons I love Gullifty’s is that they’re always playing an 80s XM station–probably 80s on 8 or something. Last time I was there, I heard “The Glamorous Life” while I was washing my hands in the ladies’. Today, as we entered, they were playing “Puttin’ on the Ritz” by Taco. Halfway through our chicken fingers and cobb salad, this song kicked in. To say I plotzed would be an understatement. The nice families eating their Friday fish were treated to a full-on chair dance, and Gillian even highchair-danced a little. I explained to my two-and-half-year old that Janie and Jeff won the dance-off to this song, even though they totally didn’t deserve it, except they did, and I realized that I had no choice but to blog about “Girls Just Wanna Have Fun,” the greatest 80s teen movie ever. It is not the greatest movie, mind you. It’s not even the greatest slumber party movie. But it is the greatest 80s teen movie, because it manages to build in all of the requisites of an 80s movie, but it also includes Helen Hunt, a Solid Gold knockoff, and the guys from the “Total Eclipse of the Heart” video. 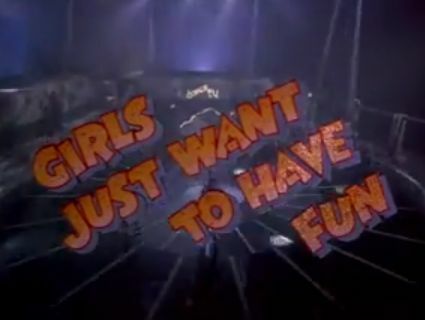 Brass tacks: Girls Just Want to Have Fun has it all, including a title ripped off from Cyndi Lauper’s biggest hit, and a cover of said song in the movie, probably because she’d already sold music rights to The Goonies and didn’t want to do it again. Let’s break it down, item-by-item. You cannot, cannot, cannot have an 80s Teen Movie without one. Basketball games, football games, ski races, footraces, sail races, Battle of the Bands, dance contests: it is a must. How was this song not a hit? Daddy was a Marine; Mom is a silent-but-strong type who doesn’t support anyone until way too late in the movie. Is it Footloose? Close enough. I know the judge is not Kevin Spacey. But it should be. BOTH protagonists have wacky friends in this case, but please, let’s us focus on Helen Hunt, who would go on to win an Oscar for a movie in which, as far as I could tell, she didn’t do anything but a bad Brooklyn accent. But in GJWTHF, she sang “The Banana Boat” song during choir practice, and Velcro’d her plaid uniform skirt inside out so it was all furry-mini. Don’t worry about how damned hot that skirt would be if she actually wore it; the important thing is, she did. To babysitting. See “Private School” for reference. In GJWTHF, it was giant bull-dyke aerobics instructors lifting a car. See “Square Pegs,” “Flight of the Navigator, “Footloose,” and every other movie in the 80s for reference. But this is the only one where we get to see her body double to a front handspring. The most important thing, though, is that they get into dance contest on time, and they win it in a dance-off (tied with the BrattyDeb, of course). The mystifyer here, though, is how they managed to win. They’re terrible. They tumble some, sure, but they’re really, really terrible. Watch the first video again if you don’t believe me. And then get happy, anyway, when BrattyDeb’s Silver-Haired Daddy totally disses BrattyDeb just because she loses. With parents like that, who wouldn’t turn out well? Honorable mentions for 80s movies that this movie also includes: Identical twins; Velcro; private school; and climbing out a window. This entry was posted in Girls Just Wanna Have Fun and tagged dtv, girls just want to have fun. Bookmark the permalink. Ha ha ha! Awesome! I forgot that she wore that skirt to babysitting. Oh and I’ll add 11. Painting, cleaning and fixing montage. Word, shindancer! I almost wrote about this movie for International Women’s Day, but got too depressed. Epic post, RocketGirl. Love this movie, even though I groan at the final move during the dance off every time I see it. Sure, I’m no gymnast, but I know you are supposed to tuck your legs. And what’s with the hug – while they are supposed to be dancing! – just because they think they totally nailed that last double handspring. Sloppy! Jeffy is sooooooo very John Cougary! And his name is Lee Montgomery. I think. EXCELLENT call, Eileen! Another 80s prereq: Robert Downey Jr. looking like a drug addict.